The purpose of this study was to test whether low-grade Lachman test (i.e. Grade 0–1+) and a negative pivot shift at 6–12 weeks post-ACL rupture in recreational alpine skiers can be used to predict good function and normal knee laxity in nonoperated patients at minimum 2 years after the injury. 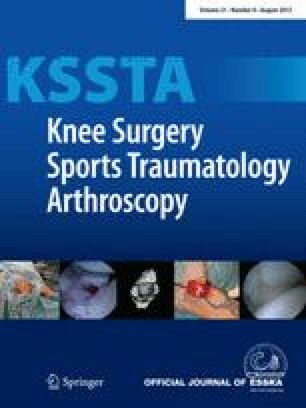 Office registry was used to identify 63 recreational alpine skiers treated by the senior author within 6 weeks of a first-time ACL injury between 2003 and 2008. Of these, 34 had early ACL reconstruction but 29 patients were observed and re-evaluated. Office charts and MRI were reviewed. Inclusion criteria for this study were as follows: ACL rupture documented on MRI after the injury, and minimum 2-year follow-up. Exclusion criterion was contralateral knee ligament injury. Of the 29 patients treated nonoperatively, 17 had low-grade Lachman and negative pivot shift tests within 6–12 weeks after the injury and were recommended to continue follow-up without surgery. Of these 17 patients, 6 were lost to follow up, but 11 patients were recalled and evaluated at more than 2 years after the injury. They completed Marx and Tegner activity level and IKDC subjective scores, physical examination of the knee and KT-1000 anterior laxity assessment. Median age at injury was 43 years (range 29–58). Median follow-up was 42 months (range 30–68). Mean IKDC subjective score at latest follow-up was 91.6 ± 6.7. Median Tegner score was 6 (range 6–9) before the injury and 6 (range 4–6) at latest follow-up (p = n.s). Median Marx score was 6 (range 0–16) before the injury and 4 (range 0–12) at latest follow-up (p = 0.03). Ten patients had Lachman Grade 0–1+, and one had Lachman Grade 2+ at latest follow-up. KT-1000 showed mean side-to-side difference of 0.8 ± 1.6 mm, and less than 3 mm difference in the 10 patients with Lachman Grade 0–1+. Recreational alpine skiers who sustain ACL injury should be re-evaluated at 6–12 weeks after the injury rather than being operated acutely. If they have negative Lachman and pivot shift tests at that point, they can be treated without surgery since good outcome and normal knee anterior laxity at more than 2 years after the injury is expected.